Society Chairman Chris Curry had a great day at Carlisle on Friday 23 November when his bull not only secured the championship at the pre sale show but went on to sell for the days top price of 5,400gns. 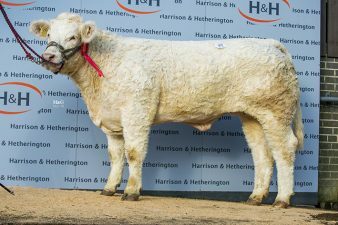 11 of the days small but high quality offering of Charolais bulls sold, representing a 79% clearance rate and averaging £3,723. 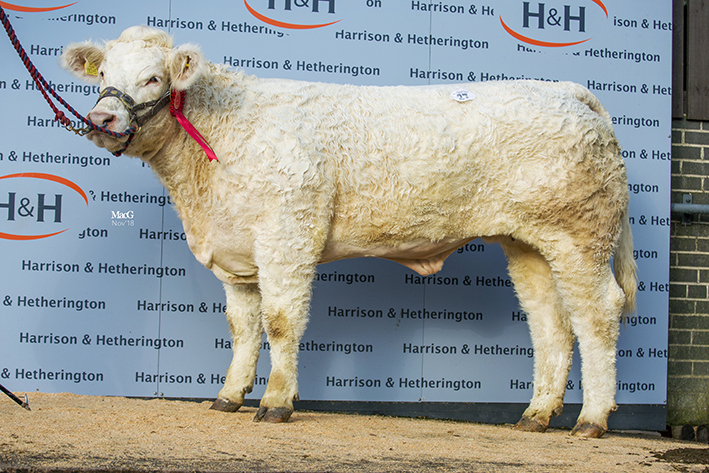 All of the Charolais females on offer found new homes with the female champion securing the highest price. 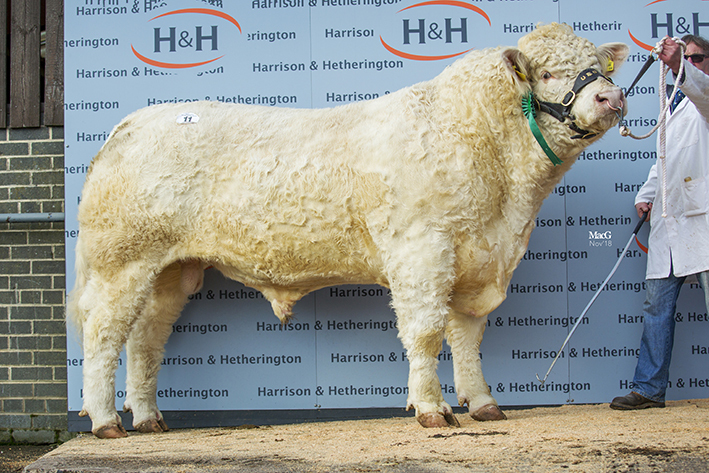 The sale topper at 5,400gns was Chris Curry’s supreme champion Burradon Nicodemus, from Morpeth, Northumberland. Chris’s success comes on the back of him being awarded the reserve junior championship at Stirling last month, a title which bagged him a 13,000gns price. The 17 month old Nicodemus has the same sire as the Stirling bull behind him, the 14,000gns Stirling junior champion Blelack Imperialist, while his home bred dam Burradon Ingrid is a daughter of the 10,000gns Puntabrava Federico. He goes on Broughton to work for P Smith and Son in Lanarkshire. Second top price was Gretnahouse Newlook, an April 2017 born bull from Alasdair Houston, Gretna Green, Dumfriesshire, who was knocked down sold to D and W Bowman, Carsluith, Wigtownshire, for 5,000gns. The 17,000gns Balthayock Gladiator is the sire here and his dam is the Blelack Digger-sired Gretnahouse Garadise. Just behind at 4,500gns was one of the oldest entries at 26 months and second lot in the ring. Laverock Misty who was purchased by JT Coxon, Hepscott, Northumberland, is the first sold son of the homebred sire Laverock Inkspot and his dam Laverock Indigo goes back to the 19,000gns Perth reserve junior champion Corrie Alan. Misty was tapped out first in his class at the pre-sale show for breeders and exhibitors W Richardson and Sons, Kendal, Cumbria. Next and selling for a 4,300gns price tag was an entry from J Warnock, Biggar, Lanarkshire. Dreva Neptune, a 19 month old son of the 13,000gns Highland Show junior male champion Kelton Trident and Dundas Pedro daughter Dreva Jean was purchased by D Graham, Canonbie, Dumfriesshire. 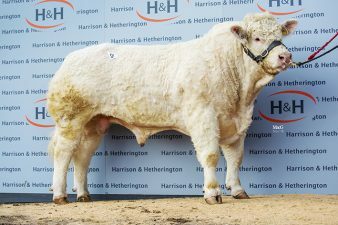 Just a few minutes earlier, the reserve supreme and male champion Bleasdale Nehemiah from Messrs Kelsall and Marsden, Preston, Lancashire, was snapped up by D Hyslop, Wamphray, Moffat, for 4,000gns. The March 2017 born Nehemiah is a 12,000gns Carlisle reserve senior champion Wesley Equinox son and bred out of Bleasdale Jennifer, a daughter of the 16,000gs Royal Welsh Show reserve male champion Anside Foreman. 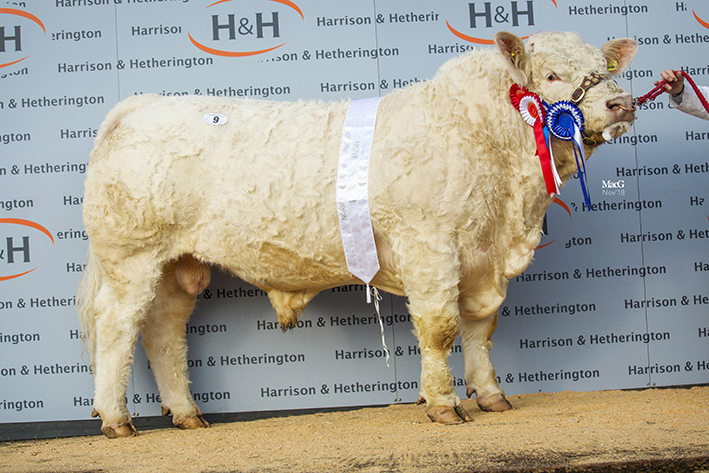 The star of the female section and commanding a 3,600gns bid from S and GA Potter, Topcliffe, North Yorkshire, was the female champion Crookdake Maggie. The 10,000gns Perth supreme champion Thrunton Bonjovi is the sire of the two year old Maggie, who sold served to the Great Yorkshire Show reserve senior champion Sportsmans Linesman, while her dam is the Newhouse Bigal-sired Crookdake Gorgie. 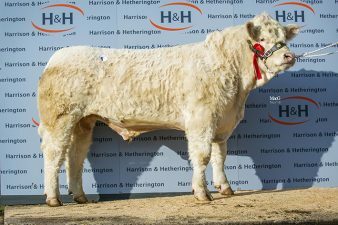 She was offered for sale by David and Sharon Miller, Wigton, Cumbria, who were also the consigners of the only cow and calf lot at the sale. Crookdake Jewel sold along with her four month old bull calf Crookdake Olly who is by the aforementioned Sportsmans Linesman for 3,000gns to ST and JE Foster, Skipton, North Yorkshire. 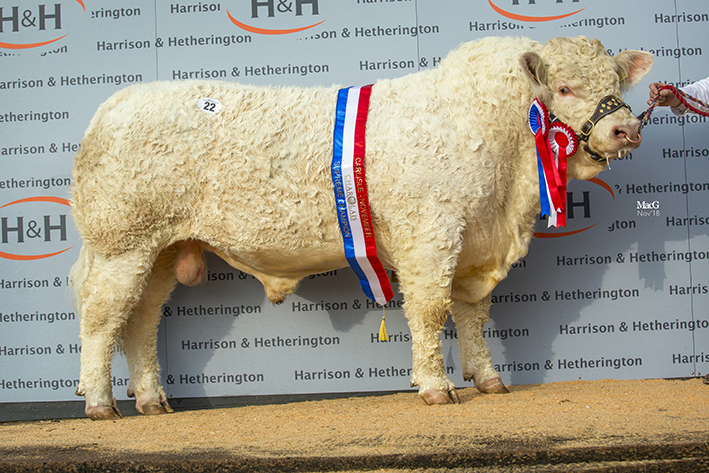 The 2014 born Jewel, who is sired by the Royal Highland reserve junior male champion Elgin Davinci, is out of the 25,000gns Perth supreme champion Goldies Unbeatable daughter Crookdake Diamond and sold back in calf to Linesman. Auctioneers: Harrison and Hetherington Ltd.
Judge: David Thornley, Swaldingcote, Derbyshire.